"An Agile Absence on the Air"
Here is an abridged version of Christian Wiman's resume: He edited the magazine Poetry for a decade. He has authored four books of verse: The Long Home, Hard Night, Every Riven Thing, and, now, Once in the West. He has, in addition, published scores of prose pieces, chief among them a spiritual autobiography named My Bright Abyss. He is, by any account, one of America's preeminent living poets. I know: we all are—but the difference is that most of us get to die unwittingly for a good long while. In fact, most of us get to die slowly enough that we can blithely call all but the last few months (or less, if we can avoid catastrophe) of our dying "living." Wiman, on the other hand, had not yet turned forty when he learned the polysyllabic label for an illness all but guaranteed to stop his pulse and breath. It is a blood cancer, and it has no known remedy. It follows no reliable program. So, while he cannot be sure that he's dying faster than the rest of us (I pray he isn't), Christian Wiman is not blithe about either life or death. 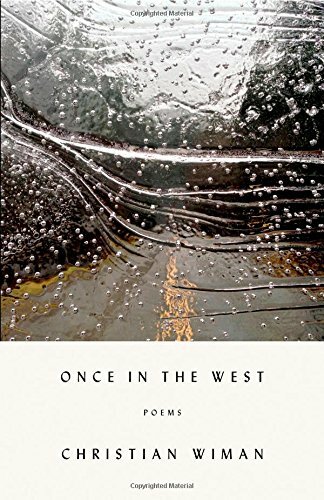 At least not in any of the poems in Once in the West, which plumb the poet's boyhood and adolescence in West Texas and survey, too, the other places, other stories Wiman encountered after he had come of age. As for the kind of things that catch his attention, they include "a pick-up / aboil / with birddogs" on one occasion and a flotilla of crocodiles on another. He writes about evocative outings: visiting a gardener who decorates with "random wall-blobs impastoed with jewels and jowls" and visiting Chicago's Shedd Aquarium with his wife, his twins. For all its everyday oddities and beauties, though, the centripetal force in this book is mortality.